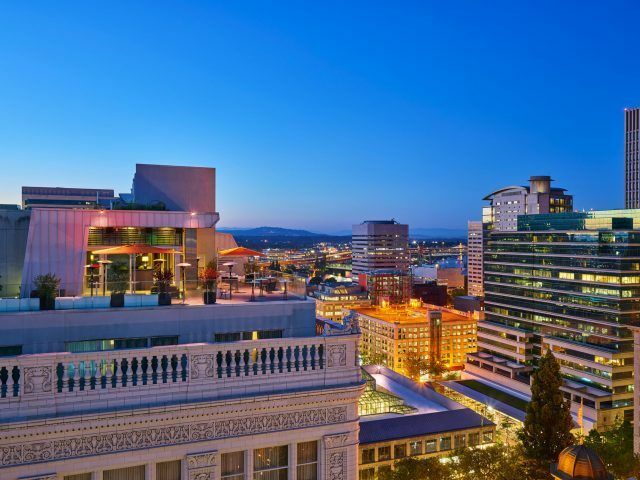 Located in the heart of downtown Portland, Departure Restaurant sits atop the Nines Hotel, offering incredible views. Departure Restaurant offers modern Asian cuisine in a sleek, cosmopolitan setting with two outdoor decks and stunning views of the city, mountains and river. Traditional Asian preparations meet Northwest ingredients in signature dishes such as the restaurant’s grilled kushiyaki selections, kobe meatballs and maguro karai honey sushi rolls. Guests are whisked directly to the 15th floor by elevator from the ground floor lobby of the Nines Hotel and immediately enter through the “barnacle”, a low ceiling entrance. The main dining room is an intimate space with a teak-clad bar situated below a 65-foot long windshield skylight. A custom-made wooden structure shaped like a “smokestack” juts above the bar and makes reference to the ocean liner theme. A nautical mural of fantasy islands wraps around the main dining room. The bar is the epicenter of the dining room and a place to be observed. Dining room booths face in toward the bar and the area is defined by marine teak decking, sailcloth panels and helm bar seating. Outdoors, two open patios invite guests to relax and view the urban horizon. The modern Asian menu will be divided into sections such as Zensai (starters), Dim Sum (small plates), O Sui Mono (seasonal soups, broths and noodles), Kushiyaki (skewered and roasted on Japanese charcoal), and Gohan No Mono (Rice dishes). The menu also mixes in the flavors and dishes of other Southeast Asian countries from Malaysia and China to Laos and Thailand. The menu is available throughout the restaurant and lounge and presented for easy sharing. Departure’s beverage program complements the culinary journey throughout Asia with an extensive list of more than 30 specialty sakes and shochu. The sake list includes unfiltered, seasonal, and house style sake, as well as shochu, a distilled beverage native to Japan and a popular drink in the local izakayas. Cocktails are infused with the spices and other flavors found throughout Southeast Asia. Such creative cocktails include My Shy Geisha made with sparkling sake, Croft pink port and a splash of tonic water; or the signature house Margarita with fresh kalamansi juice, tequila, shochu, Satsuma orange, grand Marnier and yuzu. Departure also features a wine list with selections spanning the globe. Featuring the largest saké list in Portland, Departure Restaurant also showcases exotic cocktails and a global wine list. The saké and shochu list represents many hand-crafted, artisan producers. The 9,000 square-foot space added a new full-level 15th floor to the original 1908 Meier & Frank building and two new rooftop patios with views overlooking downtown Portland, the Willamette River, Mt. Hood and Mount St. Helens. The menu draws much of its inspiration from the food discovered in the neighborhood Izakayas in Japan. The traditional cuisine is re-interpreted using seasonal and local ingredients, as well as a modern and sophisticated presentation. Departure Restaurant boasts the design skills of Jeff Kovel of Skylab Architecture, one of Portland’s leading architectural firms. Extended hours will be effective August 3rd until the rain comes in October.